5/26/2013 – So I was cruising along at a good clip on a fine Sunday morning, doing a route as I usually do. Going in and out of streets, smiling at the dog walkers and baby walkers and the people with walkers as they gave me weird looks as to what I’m doing, when suddenly, just turning in from Westmount Road W into Westood Drive, I heard a hissing sound in my back wheel. “Uh oh” I thought, and quickly pulled to the side. 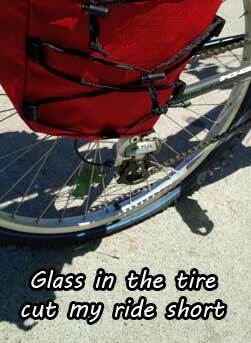 Sure enough, a piece of glass on the road had pierced into my rear tire and it was flat within minutes. Only about 13 km into a 27 km route, I was disappointed over the outcome. 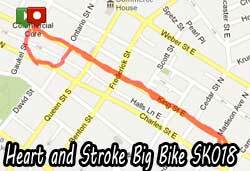 I wheeled myself slowly to the nearest bus stop and proceeded to make my trek to BikeFest via transit. I have to say, if someone told me that I had to have a tire failure and asked me to pick a day, the day of the BikeFest would have been it! It was amazing! You can win prizes, Ziggy’s and Braun’s were both there doing free tune-ups for your bike. You could listen to information sessions and lectures on how to bike safely, as well as try out various other types of cycles (electric bikes!!). There was music playing by the stage, cotton candy, and so much more! Today at BikeFest, the 16 challengers of the Bike 2 Work Challenge 2013 were announced. These lovely gentlemen and ladies would be biking to work at least 3 times a week for the month of June and blogging about it! Man, if I had known about this earlier I would have signed up (hey, I’m basically doing that already :P). Back to my busted bike! 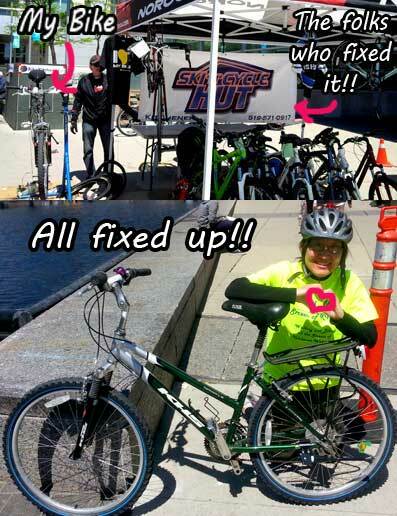 Greg Shannon from Ski’N’Cycle Hut fixed me up with a new tube in virtually no time and at a very reasonable price! He tuned-up my bike and it’s riding now like never before. I love it! These guys are real professionals. We were standing there amazed at how quickly the wheel came off! We blinked and it was fixed! He advised me that my tire is due for a change soon (it’s cracking at various spots pretty badly). I’ll have to make some time to visit their store for a new tire in the upcoming months. If you need some work on your bike, I highly recommend these lovely folks! 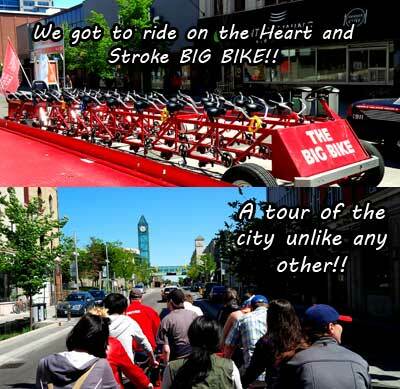 If just checking out the various things at BikeFest wasn’t exciting enough, Heart and Stroke Foundation was there with THE BIG BIKE! With a donation, we got to ride on THE BIG BIKE! and what a great way to view the city! It was amazing how a huge 30 seat bike, led by a police car, would attract so much interaction with the passerby. People waved at us, cars honked enthusiastically as we passed by, and we blared music from the speakers (somewhere attached to THE BIG BIKE) loud enough to hear the next block over. So I didn’t really get too much in terms of mileage coverage today on the Streets of Kitchener-Waterloo, but I gotta say it was an eventful day altogether. Keep on cycling people, and enjoy the summer weather! I’ve been enjoying your rides. Great day for a flat indeed. Thanks so much for reading Keith!